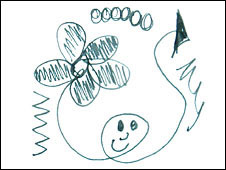 Doodling may look messy, but it could in fact be a sign of an alert mind, a study suggests. Plymouth University researchers carried out memory tests on 40 volunteers, asking them to listen to a phone call and recall names and places. Doodlers performed 29% better than non-doodlers, the team found. Experts said doodling stopped people from daydreaming, which was a more taxing diversion, and so was good at helping people focus on mundane tasks. During the study, half of the volunteers were asked to colour in shapes on a piece of paper while they listened to a 2.5 minute telephone message. The other half were left to their own devices while they listened. Both groups were told the message would be dull, the Applied Cognitive Psychology journal reported. Afterwards, both groups were asked to write down eight specific names and eight places mentioned. The doodlers on average recalled 7.5, while the non-doodlers only managed 5.8. Lead researcher Jackie Andrade said: "If someone is doing a boring task, like listening to a dull telephone conversation, they may start to daydream. "Daydreaming distracts them from the task, resulting in poor performance. "A simple task, like doodling, may be sufficient to stop daydreaming without affecting performance on the main task." Professor Alan Badeley, from the British Psychological Society, said: "Doodling is a relatively undemanding task so this makes sense. "The temptation during meetings or telephone conversations that you are not particularly engaged with is to start thinking about things. You visualise things such as holidays. "That then takes you away from the task at hand. Or you may even end up nodding off. "However, by comparison, doodling is not that taxing and keeps you more alert so you are more likely to absorb what is being said."